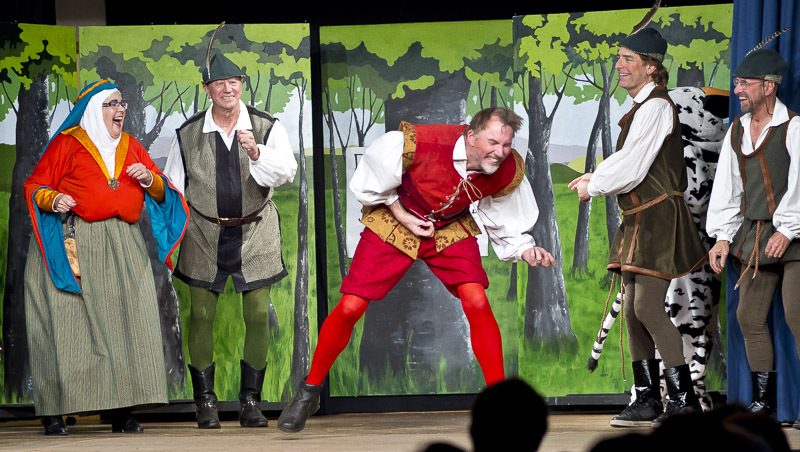 After four sold out performances, the verdict appears to be in: Robin Hood and His Merry Men (by Robin Bailes and Jonathan Hales) was the BEST PANTO EVER! Congratulations to director Miranda Holmes and the amazing cast. Another big shout out to the set designers and the costume queens. And everyone else involved both on and off the stage. The cast of Robin Hood and His Merry Men. Back row, l-r: Herb Metcalf, Jenn Feenan, Nadine Mourao, Roger Carter, Doris McLaughlin, Cec Ashley, Joe DiCara, Nick Squire, Jean Wyenberg, Paul O’Sullivan, Aleksandra Brzozowski, Alex Dewar. Front row: Sam Hooton, B J Godson, Steve Elder, Lesley Hazeldine, Adela Torchia, Esther Moncrieff , Klaus Horky, Madeleine Ani, Ginny Lowes.